In preparation of a coming course on water quality, I went back to my favourite stream for a recce yesterday. First time I ever saw an excavator clearing debris and aquatic plants from the stream though this should not be surprising. The stream often is muddy and overgrown with Hydrilla. Someone has to maintain and clear the channel for storm water collected in the Bukit Timah area to flow all the way to Pandan Reservoir. The riparian zone next to the stream in the secondary forest has been completely cleared. This was taken in 2008, showing the same patch of land (then forested)beyond the railway track. The riffles are now under a wooden bridge for trucks. Both sides of the stream are not spared. The riffles as they were in 2009. Even the belukar was turned into a nice field. The beluka as it was in 2009. 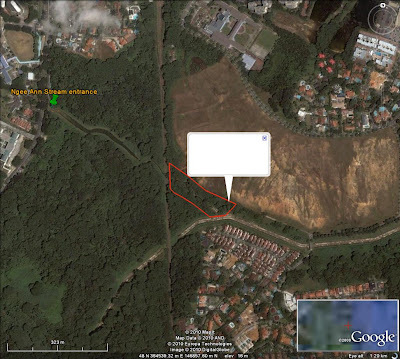 A large patch of land was already cleared when this satellite photo was taken but even the small sliver of secondary forest (in red outline) bordering the stream is now gone. I guess the property hunters will soon have another condominium to fight over. As given in the URA Master Plan 2008, this area is planned for residential purpose. As for me, I will continue using Ngee Ann Stream as my living classroom though I will have to alter my teaching route and miss out the wonderful shade and undulating terrain of the secondary forest.